Trying to raise my kids the best I can: Let's talk about paper clutter! Whew, what a busy week I've had! We all had the flu (ironically) and we moved! And I'm wrapping up school!! (See countdown at the top of the blog). I'd like to talk about paper clutter. My dear mother taught me how to file away paperwork. What a useful tool. 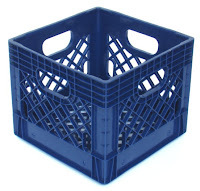 I have found the ideal amount of space needed for your file folders... drumrole please... one plastic milk crate. If you go through it every once in a while- say, once a year- and dispose of the papers and files you don't need any more, you can keep your storage down to this size. LOL - Soooooooooooooo true Deena!!! It's a great skill/ tool to have too isn't it. I love the new filing system we've set up a few months ago, and the best benefit is out of the papers that you do need to keep, when you need them - you know EXACTLY where they are. All people should master this! It would create so much more eficiency in homes. They say if you live in clutter your mind must be a reflection of that state. FIFTEEN DAYS to graduation!!!! WOO HOO!!! Congrats to you Deena, yet again, always inspiring, endless diligence and work and moving forward. You ROCK!